The decaf version of Starbucks Casi Cielo is not lore and fiction. It exists. My understanding is that Starbucks produces extremely small quantities of this coffee for Canlis Restaurant. I’ve talked to many a partner who are completely unaware that there is such a thing as decaffeinated Casi Cielo. Yes, this is real. I don’t know for sure if this coffee offering has year-round availability at Canlis, or limited availability. The image that goes with this blog post is a bag of decaf Casi Cielo so that you can see it is real. I have been carrying the bag around with me for eons and eons, and finally decided to use it as a blog post. Casi Cielo Returns to Starbucks January 12th! There is a prequel to this StarbucksMelody.com post: I have had this bag of coffee hanging around in my car for months and months. There are a handful of beans at the bottom, long since very stale. Just recently I was grabbing things out of my car, and I grabbed the Starbucks paper bag it was in and brought it up to my office. I wasn’t even really thinking about whether I needed to take it out of my car. I think I finally took this out of my car about one week ago. A few days ago (May 19th 2010), my car was stolen. For those who are following me on twitter, they already know that right now I am just getting by without a car, because my car completely disappeared from a surface parking lot in the Pioneer Square neighborhood of Seattle. It was really a strange sensation to walk down to the lot where I parked, along 4th Avenue South, and see the lot empty of cars except for one newer Corvette. I thought, ‘okay, I don’t drive a Corvette. Did I take the bus in today?‘ I had to repeat all of the day’s events in my head, and mentally confirm that I did in fact drive my car into work. I called the tow company for the lot, thinking it had been towed, but alas, that was fruitless. My old car is still missing. Just completely disappeared. I had to laugh: At least I got the decaffeinated Casi Cielo out of the car in the nick of time. I took this as a sign that it was time to write this blog post. Whoever has my car, amazingly, got no coffee! So this blog post doesn’t have much to say. It’s just for fun and to tell you that yes, there really is a decaf Casi Cielo, though it is impossible to come by as a coffee. Getting that little bag featured in this blog post was not easy. 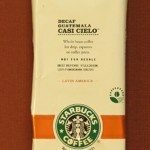 I have often thought that it would be an intriguing idea to offer decaf Casi Cielo seasonally in the Clover Starbucks stores. I don’t know if the decaf drinkers feel as though they have enough options or not. This is an open thread. Feel free to discuss any Starbucks-related topic, or suggest a new or used car for me! Or if you’re a decaf drinker, please weigh in whether you want to see this coffee more widely available. Sorry that there is so little substance to this blog post! Ah well, we have to have a change of pace now and then. Thanksgiving Blend Coffee returns again to Starbucks! Have You Tried the Starbucks Reserve Costa Rica La Candelilla Estate Coffee? As for the car :/ I hope it turns up or at least the theives caught! Okay Melody I’ll break the ice. I’m sorry your car got stolen and I hope the police can find it and it isn’t trashed. Luckily I will never have that problem because I live right on a bus line and I take care of my bus stop so I get 60 free passes avery quarter. Such a deal! I can’t believe someone stole your car! That’s awful! I hope they get caught and you can get your car back! 🙁 At least those jerks (or I guess it could be just one jerk) didn’t get your coffee! Casi Cielo was released in Japan too, but decaf Casi Cielo is not released. In Japan, a law about the import limits a market entry of Decaf Coffee from the foreign countries. I expect the revision of the law. I can see decaf Casi Cielo on this blog. Thank you. I’m sorry for trouble of your Acura. I recommend CR-Z to you as a good move item in the downtown Seattle. I visited the Canlis Restaurant website, and that place is very fancy! If I ever won the lottery and ate there, I would order decaf Casi Cielo just for the heck of it! The President of Alexander Enterprises took me to Canlis for my birthday two years ago Camspi and, while the place is fancy, it is not what it used to be. I prefer Ruth Christ’s and that’s where he is taking me this year and I’ll ask if they have Casi Cielo. Wow, sorry to hear about your car! I had my car broken into not too long ago and it just felt like I was violated. I am very sorry to hear about your car. This post and the picture is quite the scoop! I had no idea about the decaf version. Casi is one of the few mediums I like. Three Region Blend seems to have some of the same qualities, but it’s not as substantial to me and I prefer Casi. Casi is such a favorite for so many (baristas and customers). While I do not know the regular to decaf ratio for whole bean sales, I would imagine that decaf Casi would do quite well. I hope everything turns out ok with your car. Let’s stay on topic about Decaf Casi Cielo. If anything they must only brew enough decaf per customer so I’m thinking they might keep 5 lbs on hand at all times and maybe more during holidays and special events. I remember years ago when my car was stolen. An awful feeling as you say! Hope they find it. Honda Civics are nice cars. Interesting that SB only produces a coffee for a restaurant. Why would they do this? The coffee Gods were smiling on you that day. The Scrabble Gods, not so much! I miss Casi Cielo. And Peru. Wow do I miss Peru. Still sorry about your car! I wanted to say thank you to everyone who sent kind words about my missing car. It’s still so weird to me. Like aliens sucked my little acura up into their space ship and took it away. I still feel a sense of disbelief, and called the tow company again today, just to be sure it wasn’t there, and they strongly again told me that they don’t have my car. @ALN – You know more information because I told you in person what was in my car! It’s pretty funny to me because I think whoever got my car, has the contents of a car that radiates middle-aged woman: Missing car contents are (1) Scrabble board (2) Dictionary (3) Beatles remastered CDs from Starbucks Abbey Road and Sgt. Peppers (4) the book The Tipping Point by Malcolm Gladwell and (5) two knitting projects! Now there’s a hip list of stuff lieing around a car! Let me say again I’m so sorry to hear about your car. I’m partial to Hondas myself, currently driving my third Accord coupe that still looks and drives like new after over 6 years. I plan on driving it until it dies, they are built that well IMO. You asked about a small car, I’d buy a Civic Hybrid if I was in the market today for a smaller car, I think you can’t go wrong with anything they build. Hey Melody how about me? I feel left out. I said I’m sorry your car got stolen and I hope the police can find it and it isn’t trashed. and I was right after Lauri and Darkpounding and before Sarah. Gads I wish you had do overs like face book and twitter. I meant Darkkatpouncing. @Steve – Thank you for the kind words about my missing car. I do appreciate it. Sorry that I missed you above in the list – I was trying to catch everyone who said something about my car with my above reply. It’s not so much that it was a precious car – It was old. But I was the original owner of the car, and it ran beautifully, and it still served its purpose for me, without having hardly any expense – No car payment, very little gas expense, and very cheap car insurance. I had liability only. I can get around by bus, and normally take the bus downtown anyway during the week, but it was good to have the flexibility of a car, now and then. You are forgivin my friend but I wonder if Darkkatpouncing will foegive me for screwing up her name. I do wish you’d do something about this small type. I have not had a car for at least a dozen years and quite frankly I do not miss it or the gas and other expences associated with it. Being right on a bus line (the bus to town is right across the street and the bus from town stops on the same side of the street as my condo and a very very short distance from the front door and in fact some busses miss the stop by a few feet and it’s just like door to door service and with my free passes it great and like I said before such a deal! If I ever were to get a car I think I might get a Smart Car. There are a plothera of them out there and I would imagine they are very nimble and great gas mileage but for the immediate future I’m a bus man. Besides I can take a nap on the bus which I have done often. Can’t do that in a car. Don’t know if it would work for you, but you might want to take a look at Zipcar. If I lived in a big city, I’d try to get by without a car, only using one as necessary with a service like this.